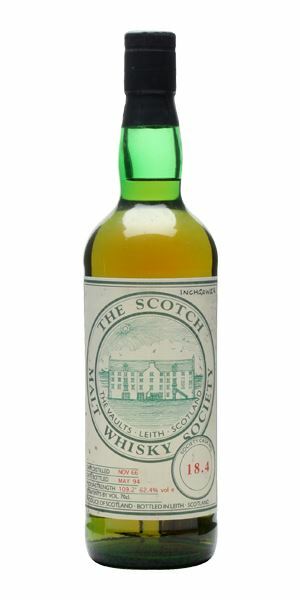 Three old and obscure single cask bottlings of lesser-known malts by the Scotch Malt Whisky Society (SMWS) form this week’s rare whisky tasting. 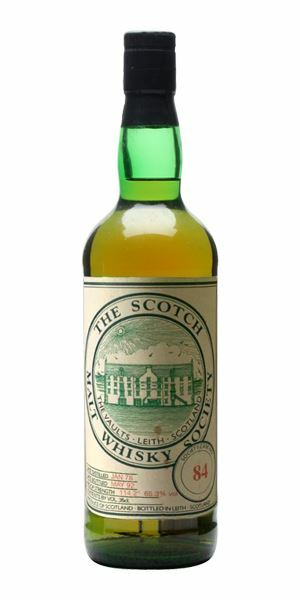 Given the prolific but also somewhat closed nature of the SMWS during the 1980s and 1990s, many of the bottlings from this era are still largely unknown, even to long-time, dedicated enthusiasts today. It’s something Angus MacRaild thinks makes them a wonderful source of surprising discovery and general tasting fun in an era when so many of the other independent bottlings from the ‘80s and ‘90s have been well documented. Kicking things off is an eye-wateringly high strength example of Glendullan. Distilled in 1978 and bottled at 65.3% abv at 14 years old, this one is notable for being released in a half bottle and simply labelled with its SMWS distillery code ’84’, rather than the usual distillery and cask number system. MacRaild finds it to be total rocket fuel, but not without its charms, especially once water is added. Following on is a 1979 Glen Esk bottled in 1994, also at a similarly nerve jangling strength of 63.6% abv. However, MacRaild finds it to be a fascinating whisky that reveals a slightly frustrating dislocation between nose and palate. Despite this the overall impression is one of deliciously waxy and enchanting old-school Highland malt whisky. Unintentionally though, the best is kept for last with a stellar 1966 Inchmurrin bottled in 1994 at 62.4% abv. MacRaild finds the mix of exotic fruits, oils and waxes balances in perfect harmony with the plush and more extractive woody tones and spices. Exactly the kind of hidden gem, he says, that can be found among the earlier SMWS bottlings. Closed for business… at least for now. Typical late ‘70s blender’s stock – rocket fuel stuff. However, time teases it awake slowly but surely. Lemon bonbons, a touch of autolytic yeasty richness, some bread, a few twists of assorted citrus peels and a light medical hint of carbolic soap. A rough and ready, gravel-strewn minerality awakens grumpily. Probably time to add a small loch of water... We have a swimmer! A nice dance between some salty flatbreads and sweeter, fizzy sherbet notes. Still a nice, even lemony/barley quality running underneath everything. All very crisp, clean and appetising. Ouch! A certain amount of alcohol needs to be waded through. However, beyond the initial liquid magma effect there’s a plush, fatty maltiness to be found. Dusty malt bins, crushed tea biscuits, sooty coal scuttles, lemon cough drops, dried lavender and rye bread. Fascinating and technically pretty decent, if not exactly uber-pleasurable. After a rather hefty dilution there’s a wonderful oiliness with white pepper, pineapple jelly, honeyed oatmeal and hints of white flowers and gauze. Good length. Back to the bakery with these doughy and fresh pastry notes. Some lanolin, cough mixture and fruit loops as well. Not an obvious, or particularly easy whisky, it has to be said. But it is also rather charming in its own way. Brutal at first, yet opens up and swims well with water. The kind of dram you could have some fun around a table with friends and pipettes. When something a little stronger than petrol is needed to start a damp bonfire. Tough at first – a wall of granite. Perhaps some concrete gently infused with lemon. One of these profiles that’s all chalk, ink, limestone, scrunched newspaper and carbon. A wee oily lick of barley sloshing in the depths. There’s also, given time, a suggestion of some old-school Highland waxiness. Pretty much crying out for water... dilution gives it this brioche and buttery pastry note along with hints of clover, camphor and fresh paint. Still a tad closed but you feel it’s evolving in a plodding but assured manner. Ooh! When neat it’s a total world away from the austerity of the neat nose. This is an almost Clynelish-esque level of saline, white-fruited waxiness. Lots of beach pebbles, mineral salts, hessian, wild flowers, pollens, medical tinctures and good, plain old waxiness. Really excellent and characterful. In the same vein as many of these departed Highland names such as Glenlochy, Glenugie etc. With water: superbly petrolic, mentholated, oily, waxy, peppery and medical. Lots of lanolin, baking soda, pinecones, candle wax, hessian, barley sugar and ointments. Lovely! Long, waxy, medical and mineral. Bags of white pebbles, grass, flowers, dried herbs, green peppercorns and cough medicine. There was a sense at times that the nose and the palate were different whiskies, however, it still ranks as one of the best Glen Esks I’ve ever had. I find many of them to be too austere and tough, however the fattiness and waxy qualities on the palate here were superb and really recalled many great lost Highland malt whisky characteristics. If the nose was properly in synch with the palate it would comfortably surpass 90. Recommended if you can find it. You could almost be nosing an older light Caroni rum. There’s this wonderful mix of soft brine, runny honey, background medicines and light waxiness that really speaks of a more exotic 1960s style of malt whisky. With a little opening up time there’s subtle tropical fruit notes of guava, ripe banana and mango as well. Some jasmine tea and grassy olive oil too. With water there’s coconut, sage, orange blossom and tea tree oil. Exotic, spicy and decadently rich. Terrific arrival! Rich, oily, waxy and hugely polished and spicy. Old cabinet furniture, oiled hardwoods, resins, extracts, strong earthy teas, herbal ointments, lanolin, lamp oil and pine resin. There’s quite a few grippy tannins as well but they’re well tamed by these exotic fruit syrups, clean wood spices and warming notes of bitter cocoa, old herbal liqueurs and an earthy dried mushroom powder note. Water gives more of these jammy, oily mixed fruit liqueur notes. Also crystallised fruits and some darker fruit tones like dates, sultanas and glazed citrus peels. A long, heady, lingering fumble through a darkened walk-in cigar humidor. Lingering dark chocolate, stewed dark fruits, old Cognac and earthy wood spices. 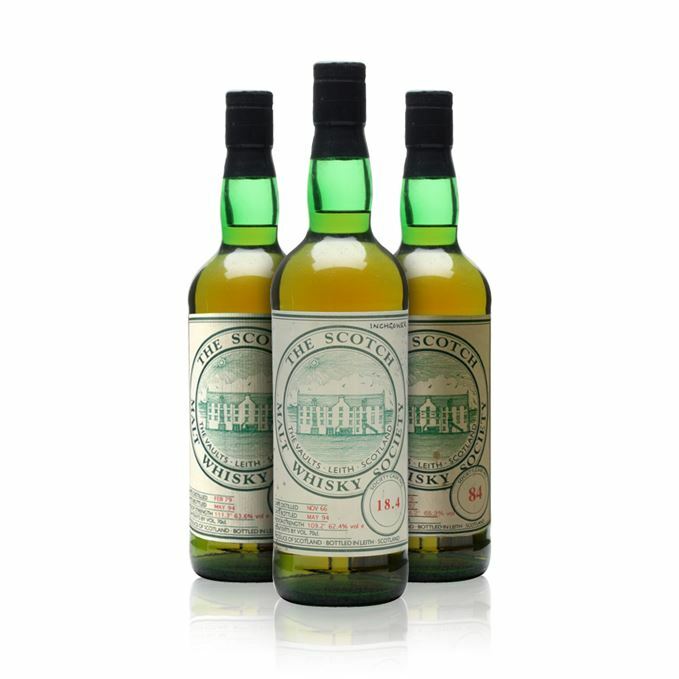 It’s not a terribly well kept secret that there were some seriously great drams sheltered in these 1960s Inchmurrins bottled by the SMWS. Also further evidence, not that it is really needed, that Loch Lomond has always been capable of making pretty serious whisky when it wants to. A total gem of a bottling. Overindulgence at the Michelin-starred cheese board on someone else’s budget. Rare Batch 53 05/12/2018 Three full-bodied 1940s and ‘50s whiskies bottled for the US take Angus MacRaild’s fancy.